Bill Nelson, Rick Scott hit each other over investments in countries sanctioned by U.S.
Scott's campaign: "Bill Nelson is fully aware and has control over the investments he makes." Nelson: "His blind trust is not blind." Both Gov. 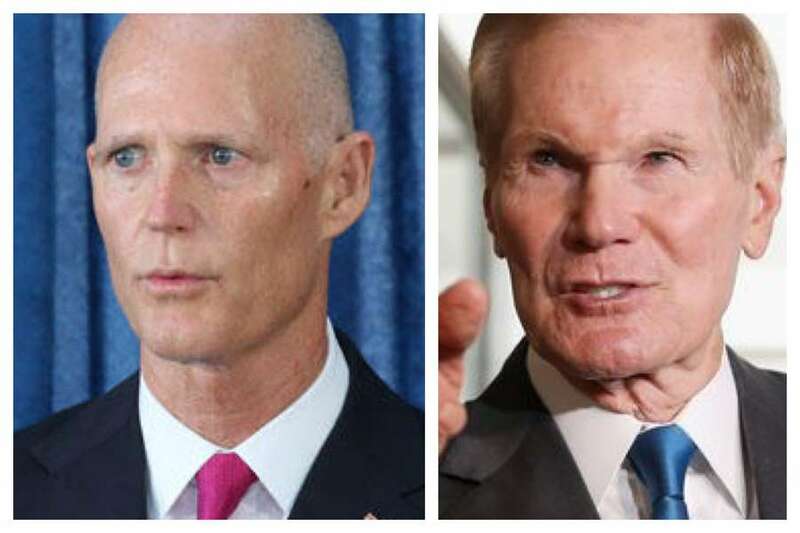 Rick Scott and Sen. Bill Nelson have made investments in companies that do business with countries under U.S. sanction. And now both candidates are pointing the finger at each other, saying each should have known about the investments before they were made. On Wednesday, the Scott campaign pointed out that Nelson also invested between $3,003 and $45,000 in the Baron Emerging Markets Institutional Mutual Funds, which has holdings with the Russian bank Sberbank — which has been the subject of U.S. sanctions. Baron is also invested in China Mobile, which President Donald Trump recently tried to block from doing business in America, citing security concerns. In total, Sberbank and China Mobile comprise about 3.5 percent of Baron's holdings. Nelson said in an interview Wednesday that his investments, which are dwarfed by Scott's, shouldn't be compared to the governor's. "There's a big difference," Nelson said. "First of all, he owns his conflict stocks outright. I don't invest in any stocks outright. I invest in a mutual fund that makes the distinction and the judgments as to what to invest in. So it is one step removed for me. The other thing is, of course, he's worth a half a billion dollars and I've got just a few dollars in a few of these mutual funds. Big difference between the two." The Scott campaign shot back in a statement Thursday, saying Nelson had full control over his investments, whereas Scott's were put into a trust about which he wasn't consulted. "Hypocritical Bill Nelson is fully aware and has control over the investments he makes," Lauren Schenone, a Scott spokeswoman, said in a statement. "Before Bill Nelson points fingers on investments, he should check his own bank account, which has been funded by taxpayers to the tune of $4.4 million." But Nelson said Wednesday he has questions about how blind Scott's trust truly is. "The newspapers around the state are beginning to point out that his blind trust is not blind," Nelson said, "That he knew all about it because the trustee is one of his business partners." Invesco, Goldman Sachs, Blackrock and Baron — all of which have vast, diverse holdings — were all primarily invested outside of the controversial regimes and companies. Because of that fact, said Mark Flannery, a professor of finance at the University of Florida, neither Scott nor Nelson should be criticized too harshly for their investments. "It doesn't sound like it should count against either of them," Flannery said. Later, he added, "I can't help but think they have more important things to talk about than each other's investments."